On October 19th, the Government of Canada introduced Bill C-19 to abolish the long gun registry. Along with other members of the Coalition for Gun Control, CFUW is very disappointed that the government has chosen to continued its charge against the registry. Eliminating the need to maintain transaction records of non-restricted gun sales. Beginning in 1977 Canada required merchants to keep the records of gun sale transactions. This obligation was removed with the introduction of the Firearms Act because all guns were registered to the owner at the point of sale. In the event that the long gun registry is abolished, these measures should be reintroduced. Several international treaties require that countries maintain firearm sales records for the purpose of tracing. Furthermore, we are strongly against the destruction of the records on the 7 million non-restricted firearms that are currently registered. This will not refund the financial investment that has been made to build the registry, nor will it be cost neutral. The Government of Canada has also failed to acknowledge that keeping the long gun registry data would be useful as an investigative tool for police officers to trace firearms. The provinces and territories may also choose to set up their own long gun registries and could significantly benefit from access to this data. CFUW strongly recommends that Club Presidents and individuals write to their Members of Parliament to oppose Bill C-19. A template letter can be downloaded here. If you are writing as an individual please remove reference to CFUW. This entry was posted in Uncategorized on October 28, 2011 by cfuwadvocacy. CFUW has joined many other organizations in critiquing the recent introduction of an Omnibus Crime bill, also known as the Safe Streets and Communities Act. National President, Brenda Wallace first called on the Public Safety Minister, Vic Toews to involve the province and territories in the decision making process, to ensure that they have a full understanding of the high financial costs this bill may impose on them. 2) can assure Parliament that the expected increase in costs can be accommodated without exceeding 100% capacity of federal and provincial correctional facilities and without increasing our current deficit. This entry was posted in Uncategorized on October 21, 2011 by cfuwadvocacy. CFUW sends its sincerest congratulations to this year’s recipients of the Governor General’s Awards in Commemoration of the Persons Case. Madeline Boscoe, R.N., D.U., of North Vancouver, British Columbia, who has dedicated more than 30 years to improving women’s health in Canada. Nancy Hartling, of Riverview, New Brunswick, who is a passionate advocate for women, focusing on domestic violence and poverty. Lucie Joyal, of Boucherville, Quebec, who has worked tirelessly for more than two decades to eliminate violence against women and children. Sharon Donna McIvor, of Merritt, British Columbia, has devoted close to three decades of her life to advancing equality for Aboriginal women. Kim Pate, of Ottawa, Ontario, who is an internationally recognized advocate for marginalized, victimized and criminalized women. Youth Award recipient Amber JoAnn Fletcher of Regina, Saskatchewan, who is an advocate for equality issues and social justice. We commend these women on their amazing work, and wish them the best of luck as they continue to advocate for social justice, equality and to improve the status of women. Congratulations! You can view photos from today’s ceremony here. This entry was posted in Uncategorized on October 18, 2011 by cfuwadvocacy. The rights of Afghan women to education and an equal voice at the bargaining table are essential to a durable peace in Afghanistan. In a country ravaged by forty years of war, almost everything needs attention. Clean reliable water sources, health care delivery and a means to escape from the grinding poverty that Afghans are experiencing can only become a reality when the men of Afghanistan recognise the importance for the whole family, of encouraging women and girls to become literate and gain the tools to participate in society on an equal basis with the men. When the Bonn negotiations open, to chart the way forward, many Afghan women fear that slender gains may be lost in exchange for concessions to the Taliban. Women need to be at the bargaining table. They need education and they need access to healthcare as the country enters the next phase. Read the letter sent by CFUW to Prime Minister Steven Harper regarding the role of Afghan women at the Bonn 2 negotiations. This entry was posted in Uncategorized on October 7, 2011 by cfuwadvocacy. I think we can all agree that ending gun violence is not simple. There are many different social and economic factors that contribute to gun violence – poverty and inequality being two important factors no doubt. It is very dangerous however, to imply as Langmann’s study does that gun control on restricted and non-restricted firearms has had no impact on declining rates of gun related homicide. There are several studies that precede Langmann’s, such as the one published in the Canadian Journal of Criminology and Justice, as well as others published by Stats Can, which show very clearly that the decline in gun-related violence, especially against women, is connected to legislative measures taken by the Government of Canada. Can gun control be attributed to the whole of the decrease? No, but Bill C-68 is associated with an average reduction in 250 homicides and 50 suicides each year according to the Institut National de santé publique du Québec. Even if gun control only saved one person’s life a year, the legislative measures would be worth it. Should we as a society take action to address the root causes of gun violence and gender based violence more general? Absolutely! Gun related violence is a complex issue, which calls for complex responses – both in terms of increasing our efforts to reduce poverty and inequality, as well as ensuring firearms are properly licensed and registered to the greatest extent possible. So let’s do all that we can to keep Canadians safe. This entry was posted in Uncategorized on October 6, 2011 by cfuwadvocacy. Today is World Teachers’ Day, which is held annually on 5 October to celebrate the essential role that teachers play in providing quality education to people of all ages across the world. It also commemorates the anniversary of the 1966 signature of the UNESCO/ILO Recommendation Concerning the Status of Teachers. This years events are focused on the theme “Teachers for Gender Equality”. Please see UNESCO’s website for more information. This entry was posted in Uncategorized on October 5, 2011 by cfuwadvocacy. 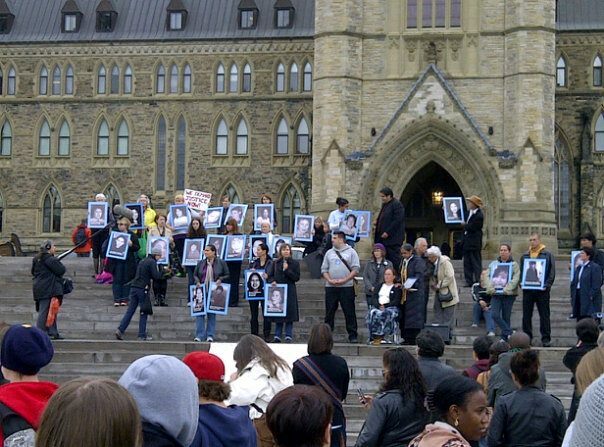 Today vigils were held all across Canada to honour nearly 600 missing and murder aboriginal women and girls. In Ottawa a vigil was held on Parliament Hill, where the many speakers called on the Government of Canada to launch a national inquiry and address the root causes of violence against aboriginal women. CFUW stood in solidarity with the Families of Sisters in Spirit and the Native Women’s Association today to show our support. We too will continue to call on the federal government to bring an end to this national tragedy. This entry was posted in Uncategorized on October 4, 2011 by cfuwadvocacy.